This was the moment a motorist, hell-bent on causing chaos after a row with his girlfriend, sparked a terror alert in one of England's top holiday resorts. Released by police after driver Jake Hartley was given five years in a young offenders' institution, this CCTV montage shows the moment the 19-year-old smashed into a council worker. Jake Hartley's spree of destruction, which sparked a terror alert in Blackpool, was caught on footage recently released by police. And, for the first time, it shows the brave efforts of passers-by, who were seen on camera chasing Hartley in a bid to bring his spree of destruction to an end. It also backs up Judge Mark Brown's comments that it was 'remarkable that, during the course of this event, nobody was much more seriously injured or killed'. The shocking footage, filmed in Blackpool, starts in The Strand, which runs between Queen Street and Talbot Road, shortly before 11.50pm on Saturday, April 14. It shows Hartley, of Rochdale Road, Todmorden, in a silver Skoda, lent to his employer and taken by him without permission, forcing his way through a crowd of revellers. Hartley, 19, of Rochdale Road, Todmorden. Minutes earlier, enraged by an argument with his partner Nadia Mullin in the Urban Lounge in the Home and HQ nightclub, he had removed his registration plates. Embarking on a two-mile journey of terror, he speeds into the council worker, who was out celebrating a birthday with two pals, knocking her to the ground and injuring her. After turning into Market Street and driving at speed, Hartley circles around towards Corporation Street, where a man aims a kick at the Skoda and falls over as people begin to give chase. Hartley pulls down a side alley and into Abingdon Street, where he drives at somebody crossing the road before turning back into Talbot Road. With CCTV operators following his every move, and as emergency services turned out to reports of a terrorist attack, he tears back down towards the club where a crowd has gathered round the hurt woman. Narrowly missing people crossing the zebra crossing, Hartley completes another loop of the town centre, smashing into barriers in Market Street, seemingly in an attempt to hit club and pub-goers. After circling round again to Corporation Street, a barrier is thrown into the vehicle's path, and a group of men chase him down a side alley. At one point, their lives look in danger as he stops and puts the car into reverse, before he pulls off again down Abingdon Street and into Clifton Street. Racing towards Talbot Square, and as blue flashing lights illuminate the town hall, Hartley smashes through roadwork barriers - where two pensioners, 73 and 80, were hit and hurt - cuts across traffic, and flees north down the Promenade, when the footage ends. The Skoda was later found in the car park of the Norbreck Castle hotel on the Prom, and Hartley was arrested nearby by armed police. 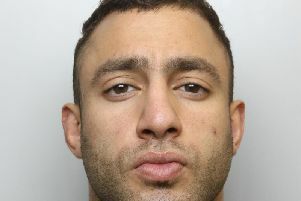 He later admitted two counts of causing actual bodily harm, causing serious injury by dangerous driving, dangerous driving, common assault, aggravated vehicle taking, drink driving, possession of a prohibited weapon (a stun gun was found during a later raid of his home), and having no insurance or licence. Judge Mark Brown said: " You have pleaded guilty to offences arising out of a very serious incident in Blackpool town centre. "If the sentence I'm about to impose is ever reviewed by a higher court, it is important the judges should view the CCTV that is available. "In my judgement this case highlights the obvious dangers created by a motor vehicle being in the wrong hands and it is understandable that initially there was a serious concern a terrorist incident had taken place. "You drove around the streets of Blackpool covering a distance of about two miles with total disregard for the safety of pedestrians and other road users. "You were swerving towards people and many of them had to jump out of the way fearing as they did for their own safety. When you were travelling along The Strand, a particularly narrow street, you were literally almost ploughing into people. "One victim has described the profound psychological impact of the event upon her."